From the Scottish borders to the counties of Yorkshire, North East England is a region often overlooked by tourists and natives from other parts of Great Britain. The region, often characterised by an industrial age long since past, has gone through immense change and regeneration. To those that know the North East, there is a wealth of beauty unspoilt by large numbers of visitors. The county of Northumberland is dotted with beautiful historic towns such as Berwick on the Scottish border, Alnwick and Hexham. It is a region of contrast. The wild beauty of the Northumberland National Park  and the modern life of Newcastle. The quiet pit villages of County Durham and the historic grandeur of Durham Cathedral . The new, the old and the disused all reside in stark relief. The real beauty of North East England is its secret. So few know what this area really has to offer. County previously known as Cleveland Now unitary authorities. Hadrian's Wall  on the border with Scotland is an 80-mile long wall built by the Roman Governor Hadrian to keep the Scottish tribes out. A UNESCO World Heritage List site with an information centre situated at Housestead, north-west of Hexham. The Angel of the North - a giant rusty/copper coloured metal angel sculpture. Next to the A1 south of Gateshead. Lindisfarne - the "Holy Island"
The Metro Centre  Europe's largest shopping centres. 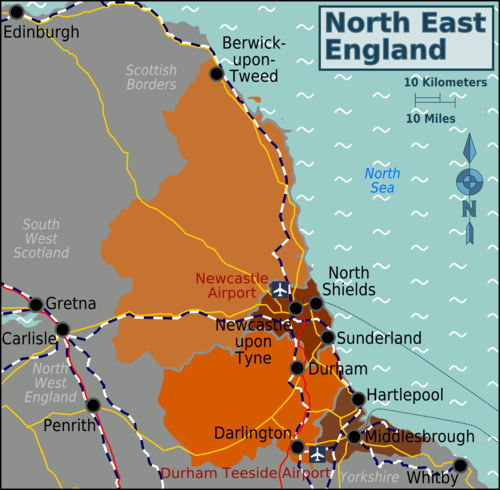 The North East is England's most northern and sparsely populated region. The area has a very long and bloody history, due to its proximity to Scotland and has fallen under Scottish hands at least once as the border shifted over time. Eating out in North East England is very much dependent on where you are. Fresh fish can be found at many of the coastal towns such as Whitby and Redcar. Fast food chains, Italian, Indian and French restaurants are all common to most larger towns. North Easteners pride themselves on serving what they argue is the best traditional English fish and chips. From the largest cities in the region to the smallest villages, a fish and chip shop and a pub are almost guaranteed. Northerners are wonderfully friendly and can always be counted on to look after those not familiar to the area. As in any large city, certain areas will not be as safe late at night. This page was last edited on 26 February 2016, at 19:31.